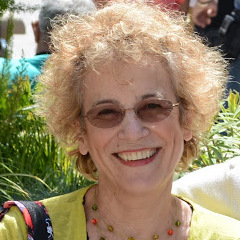 I came out of the recent Artisan III workshop with Didier Rosada at the San Francisco Baking Institute with the knowledge that it was much more useful for me to try and understand the processes used during the course of the week than to write down the exact mixing or fermenting times. Didier did his level best to get us to see that a dough isn’t necessary ready to be mixed on 2nd speed because we just spent 5 minutes mixing it on first speed. Thus for each of the breads we made during the week, he gave us the mixing times as reference points, making it very clear that back home or at the bakery with a different mixer and in a different environment, they will most likely be different (and the same holds true for fermentation, proofing and baking times). But what will NOT change and what we need to focus on is the required dough consistency and gluten development for each type of bread. So Didier always gave us these two elements of information first. For instance for the miches, he specified “Improved mix, Medium Soft”, for the spelt bread “Short Mix, Soft” and for the ciabatta that we were going to retard overnight in the cooler “Improved Mix, Soft +”. 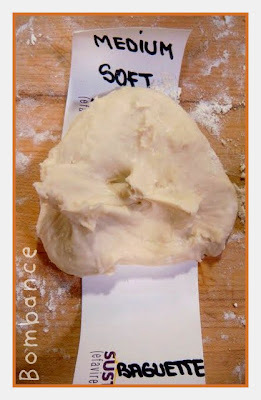 Dough consistency is sometimes confused with gluten development but they are two different things. Dough consistency has to do with the hydration rate (the amount of water the baker puts in the dough) while gluten development (ascertained through the windowpane test) is the degree to which the gluten chains are organized. Controlling the strength of the dough is the main challenge for the baker. The more we mix, the finer the air pockets and the resulting crumb. But the less we mix, the weaker the dough. One solution is to mix less but to increase the fermentation time and to fold the dough once or twice (or more, as needed). Folding however is not always an option. For instance, in a bakery where ciabattas are made on a large scale (say, 5,000 kg per day), it is impossible to fold the dough manually. A different approach is needed. 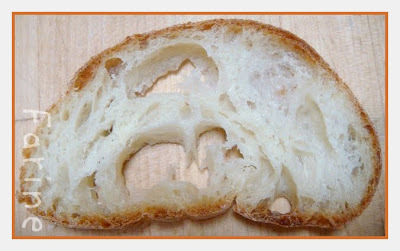 While the goal is to have a lot of free water in the dough (this free water holds multiple microcells of gas), too much water at the beginning would interfere with the gluten development and make the dough very weak. 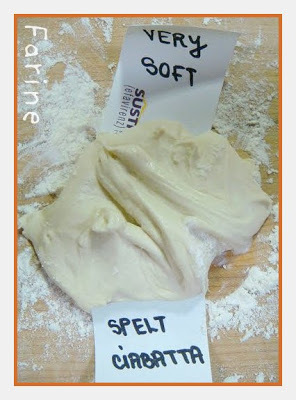 The dough is therefore first mixed to medium soft consistency (68 % water), then developed to improved. Then and only then the reserved water (usually 12 %) is added and the mixing resumes until the water completely incorporated (double hydration technique). 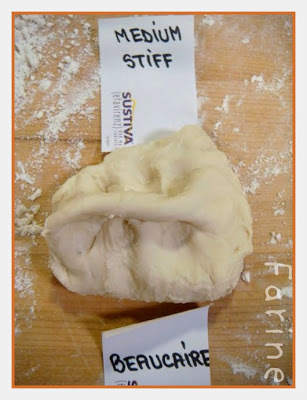 The added water coats the dough in such a way that it protects it from oxydation (which would decrease the flavor) and the resulting dough is very wet (soft +) but very strong because very developed. It can ferment in tubs for 2 or 3 hours and, without any folding, create big holes and have good volume. At home or in a small bakery where folding isn’t an issue, you can aim for a short mix, add the reserved water and then resort to folding during the fermentation. 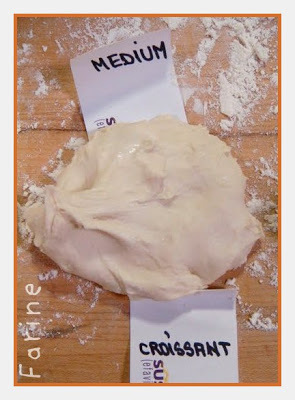 In other words, for ciabatta, consistency is always soft or soft+ but gluten development can be either short or improved mix, depending on whether or not you plan to fold the dough during fermentation. Well, that’s it for today. I hope you will find helpful this short recap of what Didier tried to teach us. Stay tuned for more Artisan III tidbits! 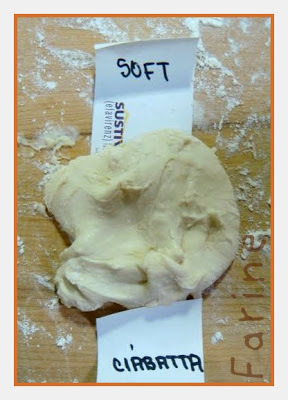 The dough is therefore first mixed to medium soft consistency (68 % water), then developed to improved. Then and only then the reserved water (usually 12 %) is added and the mixing resumes until the water completely incorporated (double hydration technique). I understand the double hydration, what do you mean by develope to improved. Hi Thomas! Thanks for stopping by. What Didier means is that first you get the prescribed consistency (here medium soft since the goal is to get to soft plus AFTER double hydration), then you develop the gluten to improved mix. Then and only then, do you do the double hydration with the extra 12% water. In other words, at the first stage of the mixing, you manipulate the water amount in order to get medium consistency. To do so, you may use all of the 68% water or even more or you may use less (depending on ambient humidity, characteristics of the flour, etc.). Because of that, whenever you first mix dough, you always reserve a small proportion of water (about 10%) which you use to adjust consistency. As to improved mix, if your question is actually about that, I would refer you to an excellent book, Bread Baking: An Artisan's Perspective, by Daniel T. DiMuzio, where the various mixing methods are very well explained. I own the book but as I am away from home, I took a look through it in Google Books. If you go at this address: http://alturl.com/ytqn and read from p. 47 on (to about 60), etc. you should find useful information on the various stages of gluten development and corresponding mixing methods. Thanks for the quick answer, and yes I own this book, since about 4 days and started to read but I'm not that far yet. Improved in you post means gluten developed and then you add the rest of the water to get the correct hydration. I will try this the next time, but before that maybe I read Dan's book. 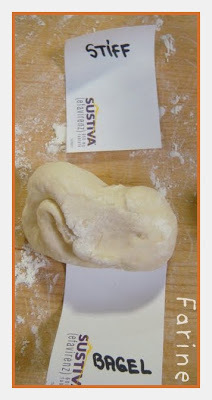 Ps: On my blog the bread page is still hidden or under construction, but you find me on TFL with tssaweber. Wow, very interesting info, I had never heard of this double hydration method… so much to know still! Making a miche at my maman's house for the memorial day weekend, we had a wonderful grand aioli last night! Loved this post, reminds me of my own pasting of those post it sticky papers from said pharmeceutical company, who's reaping the benefits? If it was the genetic lab next door I would be worried!!! Have a great German class, take notes and thanks for sharing, I need to take more classes!